A nun spikes her drinks with sacramental wine and wears red lace underwear. A soldier's wife sits by the bed of a man whose legs have been blown off, and writes his story. In the hands of the poet, Sleeping Beauty has an MRI and Red Riding Hood becomes a femme fatale. Though rich in social commentary, these three American women poets tell their stories, not in generalisations, but through each well-honed line. As Wallace Stevens admonished, "Conceptions are artificial. Perceptions are essential." The perceptions of these three are sensuous, evocative, and riveting. Categories: Books and Poetry. Tags: Post-Postmodernism and The Huffington Post. 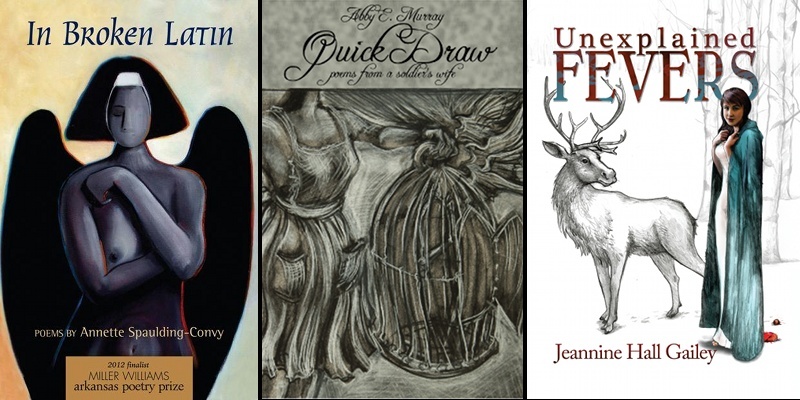 Poets: Abby E. Murray, Annette Spaulding-Convy, and Jeanine Hall Gailey.